One in 11 Americans pays an average of $91.14 per month to use self-storage, finding a place for the material overflow of the American dream. It's just mindboggling that people will pay to store their stuff when it no longer fits in the house. I mean, aside from legitimate reasons like short term solutions during moving and such... whhyyyyyy! Buy your own storage! Pay condo fees + a mortgage! I used one during my first divorce. Long term it was the divorce that was anti-Mustachian, not the storage unit. I used another one during my second divorce. Did not learn my lessons from the first marriage, I guess. I used one for a "shop" when I lived somewhere that I didn't have a garage. Needed some way to unwind in the evenings and on the weekends so I went there to tinker. Cheaper than a psychiatrist. Did that for a couple of years, then switched locale and jobs. No further need for it. Would be an expensive long term solution but then people pay alot to park their boats, airplanes and collector cars. I was spending $60 a month back then? 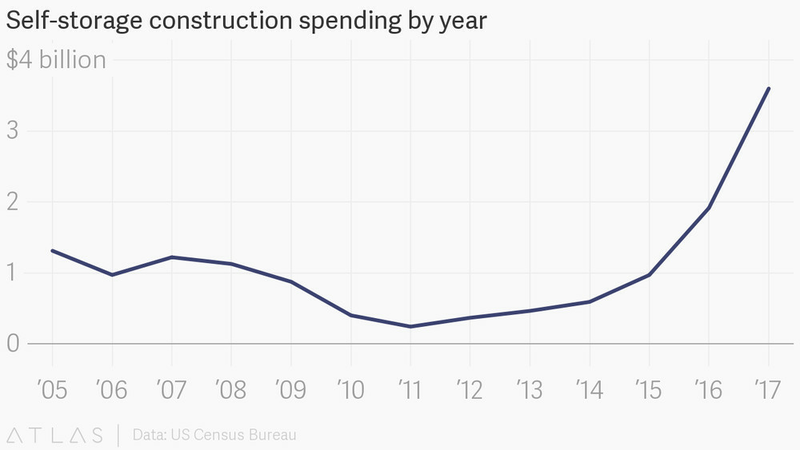 What's impressing me the most is the exponential increase in spending on *new* construction. If current trends continue it will cross the $4B threshold sometime this year if it hasn't already. That doesn't take into account all the storage space presently in use. I get that the age demographics of the Millennial generation are such that we've got a sizable population of people in transition-y stages of life where they are more likely to be in grad school, short on job security or part of the "gig economy" until they can find paying work in their own field, or perhaps deployed military. Anyone in those situations has a legitimate need for temporary storage, yet it's also a temporary need and the storage space is freed up when it's no longer in use. For the construction expenses to be higher than the maintenance rate or to increase faster than inflation people would have to be using them on a permanent or semi-permanent basis. I wonder if this also has something to do with millennials and gen-xers living in smaller spaces. My parents never had a house less than 3,000 sq. feet, with a basement and garage. I am raising two kids in a 1,400 sq. ft condo, which does not come with a storage unit. There are storage units for only half the building and they are being treated as precious family heirlooms to be clung to for dear life. Being minimalist is fine and dandy, but I have discovered the hard way that four bicycles or four sets of snowshoes take up a sh**-ton of space. Let's not even discuss winter tires for the car. Multiply this by a few million people as part of the new trend for downtown living and it would explain the trend. At first I thought this was a site targeted at interested franchisees ... but no. The boom is not due to this..ie the transitional aspect as millenialls don't have crap to store anyway and the number of older people (genx/boomers) moving, divorcing, etc really hasn't changed. millenials and to a lesser extent genX are living in smaller places, specifically millenials, that are living in all these new apartments, very small, with roomates.....these barely have room for furniture let alone bikes, kayaks, gear, etc. and....boomers are now downsizing from their 3500 sf mcmansions to less but they are so attached to their stuff (and it is everything, not just the photos or heirlooms) or have this false belief that their kids want all their stuff. So instead of donate/trash/sell all their crap they put it in storage units for forever....never mind that the value of all that crap could possibly be repurchased new in 1-3 years with the money they are spending on the storage units. LMAO. $65k plus fees. Wow. We have offsite storage for a boat at the lake. It's $60 a month. Looks like I'm covered for 90 years. I've joked about buying my neighbors for their garage and renting it out. Compared to this, that looks like a good investment! "When your life is your passion, you need something more than a basic storage unit." Give us a lot of money for an unconditioned pole barn. While I was in a jury duty waiting room this week, I overheard two people talking. One says "I wasn't able to find [what I think was a book]. We have 4 storage units and I don't know which one it was in." I had also heard her previously talk about moving from a newer neighborhood to an older one last year. This may have necessitated downsizing but sell don't store. We are a family of 4 living in ~1500 sqft in DC, downsize from 3,400 sqft in suburbs of MA. We spent the past 2 years purging stuff out and things we thought we needed we barely miss... and we still have some ways to go. We're using a storage unit that is stupidly expensive, but recently moved cross-country right between two jobs and two major tests. I get a break in August, and whatever we don't need in that unit is going away during that month. I think you're using it correctly, provided you follow through and clear it out/end the contract this summer. My SIL has one. She is the exact demographic that has them,for the exact worst reasons.we have tried to convince her to get rid of it to no avail. She has had it for 6 years now. It is full of moderately nice furniture because she moved from a house to living with my MIL. Do the math. 7200$ on storage. She could have sold it on CL and bought way way way nicer stuff for the money. But as many poor people are,she is very attached to her stuff and isn't able (due to socialization,or culture,or mental capacity? I don't know) to see the long term big picture. She just wants to keep her stuff. All arguments of ours are met with "but it's really nice furniture!!!!!!!!!". It appears she may finally move out this summer. Odds are at least 50/50 that some of the stuff is ruined after 6 years in who knows what kind of conditions. She hasn't gone and looked at it for this whole time. I just learned that my SIL (who lives with her mother and has for as long as I've known her) has a storage unit that she now has to empty because she's going to be moving across the country soon. She couldn't make more than $30-40k per year. I can't imagine how someone who, as far as I know, has never lived alone, could have amassed so much stuff to warrant a storage unit. On a more general note, I was completely shocked when I first learned that people used storage units for long term storage. I had previously thought the entire purpose of them was for college students to store their things over the summer, or similarly temporary situations. I was also completely shocked when I first realized that it wasn't required to pay your credit card bill in full every month. I was so confused by the common pop culture phrase of "hit my credit limit" because I assumed that meant you must have spent that much money in a single month. Ah, growing up and learning how incredibly financially stupid people are! And like many people who make poor choices like this, she is probably focused on the $100/month...because it's only $3/day, right? And keeping my furniture is totally worth $3! It means Mustachians hate life. Yeah, clearly. Because anyone with any passion for life would totally need space for kayaks, hiking boots, their antiques, sports trophies from their entire life, thousands of books, all that cooking equipment that doesn't fit into the kitchen now, those art pieces you don't have room for, all those craft supplies...you know, the stuff that leads to having a passion for life. I guess. It's a weird sentence. Because only having the basic storage is for people with dull (albeit crammed full of stuff) lives? The crap from the truly zesty ones can only be contained in large spaces? This is too awful for words. 3. Mom & dad pack up their stuff, it all comes to my town and is loaded into a storage unit. 3a. Me and sis sell/donate/whatever is left at the house that didn't get moved. 4. Mom & dad move in with me while they find more permanent housing. Mom wants to buy, we're pretty sure that's not going to be possible, but she's going to have to find that out the hard way. 5. Move into wherever, in the process attempting to convince mom that she doesn't need to keep 10+ chairs that are currently not usable just because of FAMILLLYYY. 6. Get rid of the rest of the stuff in the storage unit. Throw in 2 cats, dementia, and some very stubborn personalities. Not going to be fun. This one is great, they really took buzzword usage to another level. What's in between these words doesn't matter. For the record I'm pretty passionate about staying alive regardless of my storage unit situation. I feel your pain. I'm currently in the phase of life where you become the adult to both sets of parents. My in-laws moved out here about 2.5 years ago. Getting my MIL to part w/her crap was difficult, but we purposely did not rent a truck. She still managed to blow $1,500 in postage to ship boxes of stuff. Then moved into the new place and spent more money cluttering it. They had about $200K in their nest egg, due to an inheritance. SSA was nearly $3K/mo. Plenty of room to enjoy retirement and live off SSA in a LCOL area. Lots of coaching from us about the need to not touch the nest egg. Well, MIL gets diagnosed w/stage 4 lung cancer, and dies of complications less than a month after diagnosis. No storage units, but in both houses, there were spare rooms devoted to crap. Our first task was to clear the back bedroom, so my FIL could finally use it as a proper office. SO MUCH STUFF. All of it new in box, and just GARBAGE from HSN and QVC. I took a bunch of it home, and have been slowly selling on Facebook. I've made nearly $300 so far, and I'm sure my MIL spent 10X that. This money is going to my FIL, but it's not going to stretch very far. Last week I decided it was time to attack the elephant in the room. Could FIL live on one SSA check? Dunno. We wrote down the income and expenses he could recall, and it was ugly. He seems to understand that the housekeeper, lawncare, and bottled water deliveries must go. Then we discovered that on top of their SSA, they managed to spend 20% of their nest egg! So now he's spending time at the airport near their home, trying to get a part time job to make ends meet. He wasn't that great at keeping jobs before retirement, so I'm concerned about that too. Oh, and he was an accountant. Just painful. Oh god, so glad I don't have your problems!